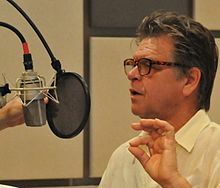 Patrick Howard "Pat" Fraley (born February 18, 1949) is an American voice actor and voice-over teacher. He is best known as the voice of Krang, Casey Jones, Baxter Stockman and many other characters. He is also known for his voice roles in the 1987 Teenage Mutant Ninja Turtles TV series. He also voiced Buzz Lightyear for actor Tim Allen in the early years in various video games, computer games, merchandise, attractions, and the Disney On Ice Disneyland Adventure. ↑ "Pat Fraley on 3 Things the Voiceover Business Is All About". www.backstage.com. 4 November 2014.